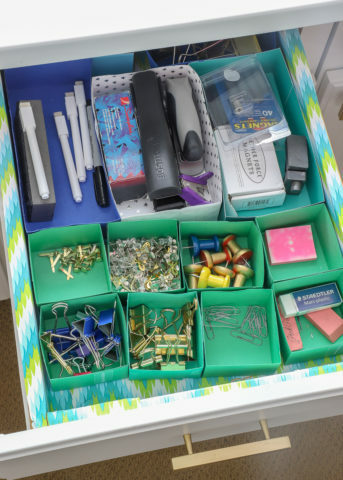 One project that has been nagging at me, pretty much since we moved in, were the 5 drawers in my office/craft room. 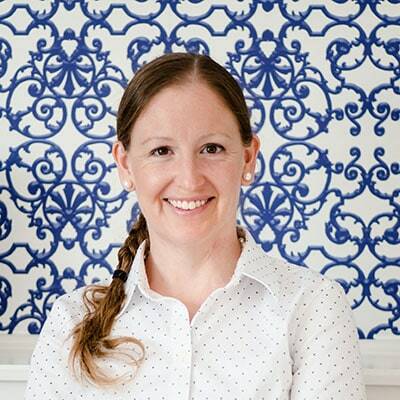 Not only were they a mess and generally unattractive; but since I interacted with them day-in and day-out, I became acutely aware of how much better they could look and function with some more streamlined organization. 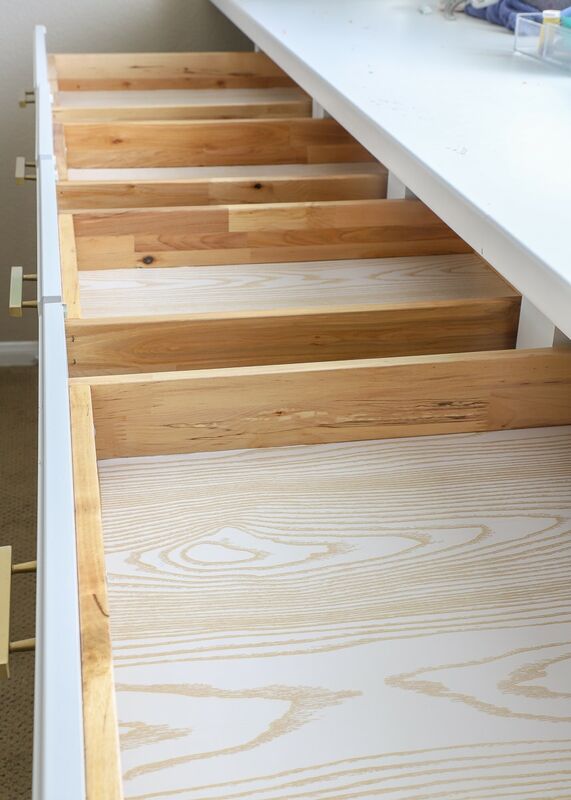 I had a plan for DIYing some perfectly-fitting drawer organizers for these drawers; but for some reason, I couldn’t get myself to make them. 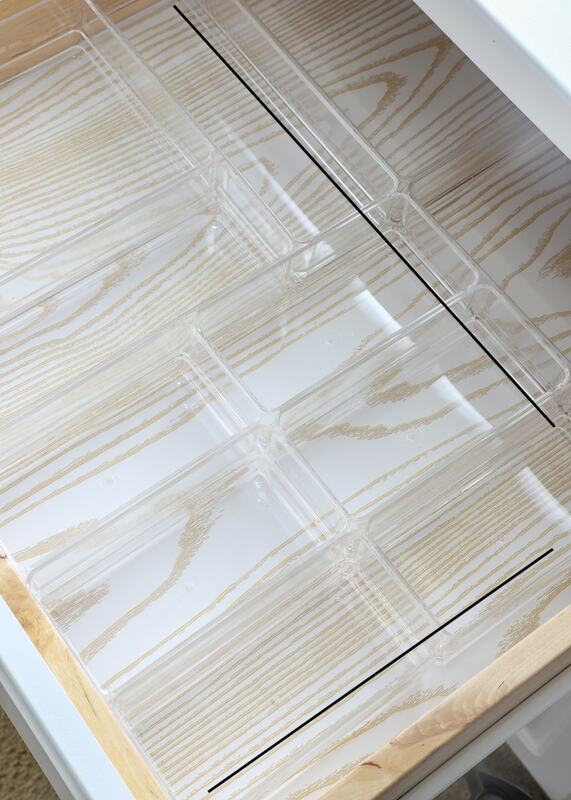 Then I stumbled upon a super versatile set of clear, acrylic, modular, and reasonably-priced drawer organizers and a plan, quite literally, snapped into place! 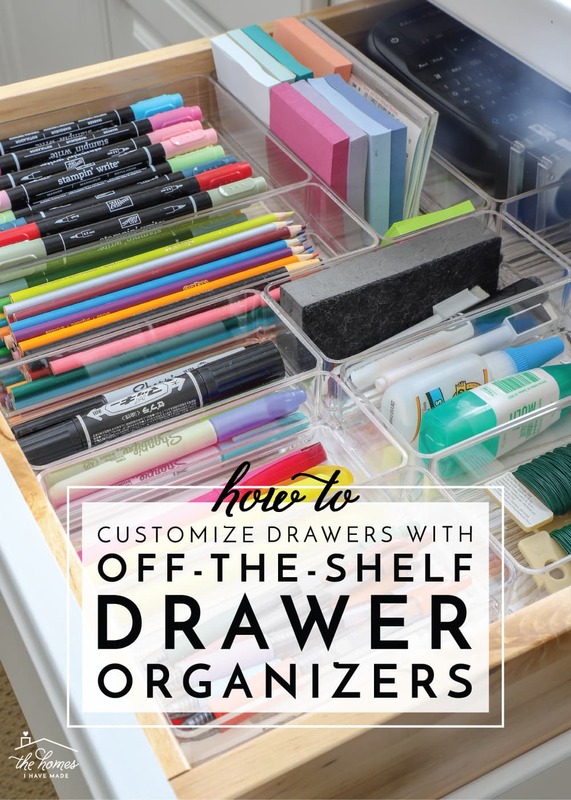 Today I want to show you how I created some fully customized drawer organization using off-the-shelf drawer organizers…and show you lots of pretty drawers along the way! In my office/craft room, I am quite fortunate to have an expanse of 5 base cabinets along an entire wall. 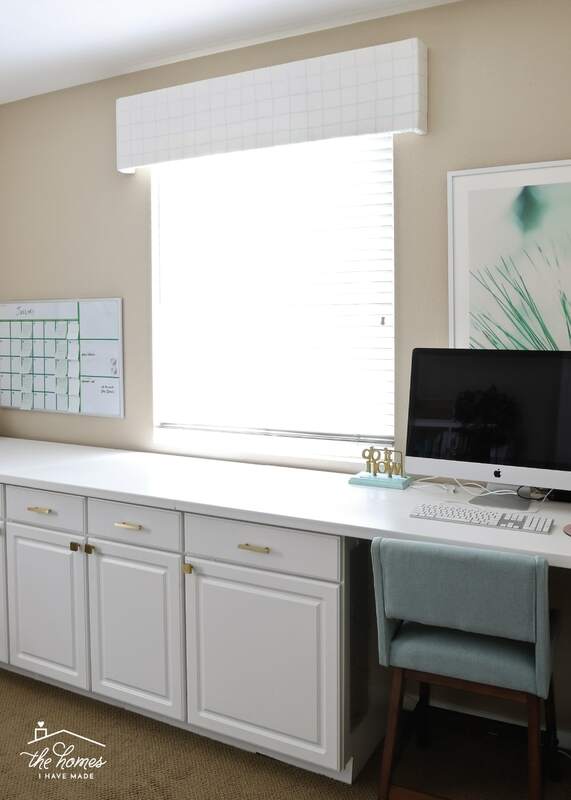 Not only does the countertop serve as my desk and primary work surface, but the cabinets and drawers beneath hold a large majority of my supplies. …and unfortunately, they stayed that way for the past few years. 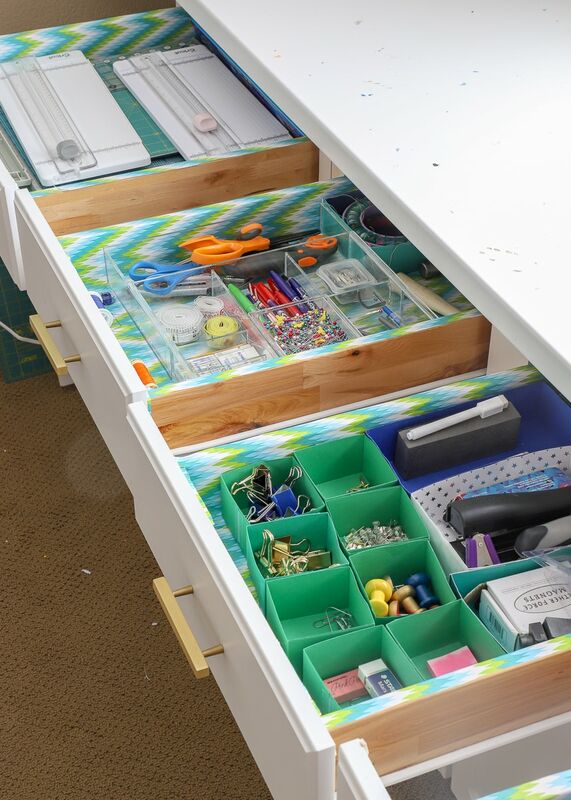 These drawers clearly needed some attention, so my original plan was to make a series of custom paper drawer organizers from heavy cardstock just like I did a few years ago. 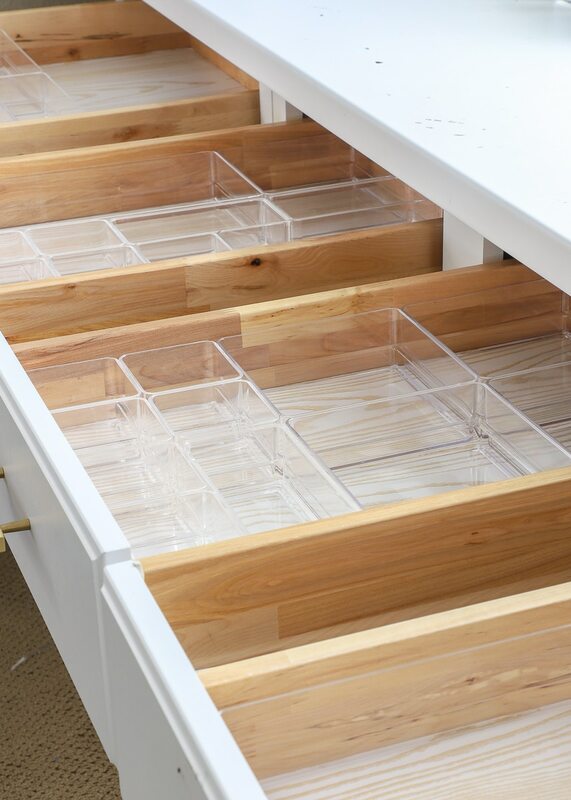 I seriously loved that project, especially how the organizers allowed me to utilize every single inch of the drawers and were super inexpensive to make. 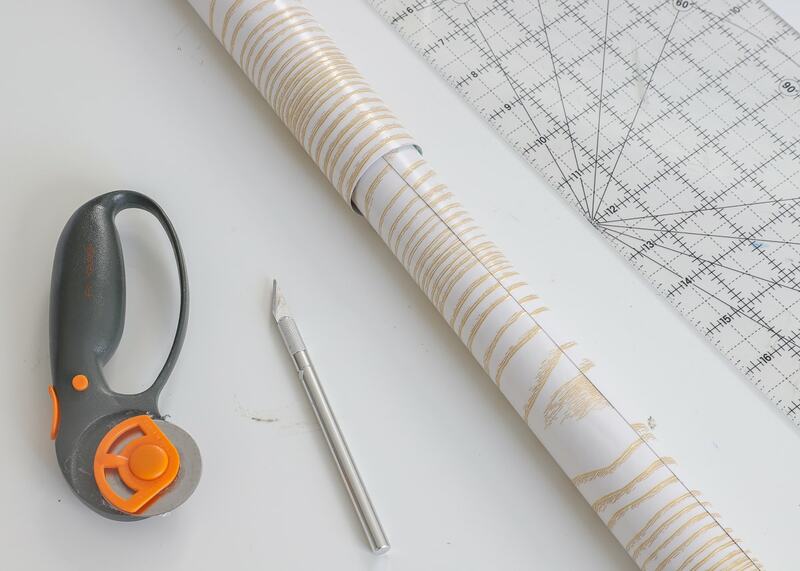 But admittedly, the project was a bit tedious; and since my energy seems to be at a premium these days, I had a hard time gearing myself up to DIY dozens of paper organizers. 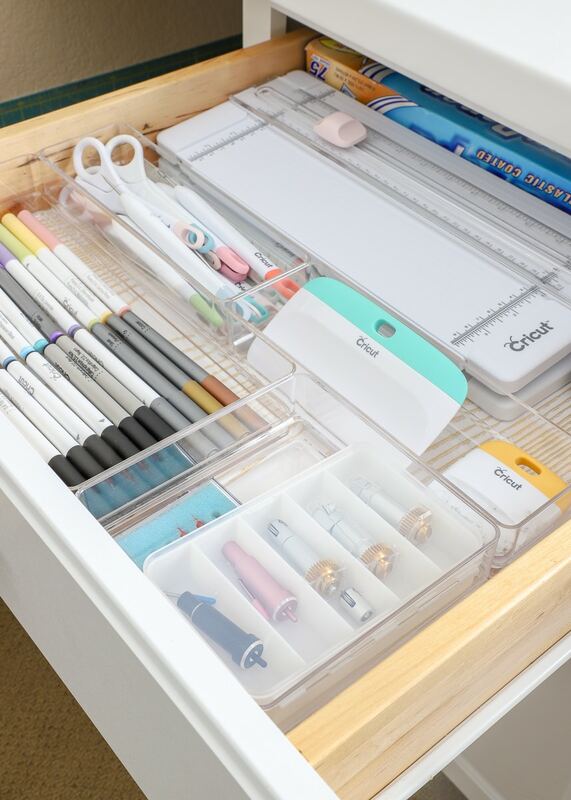 Then…when I was browsing around Amazon for something else one day…I discovered these Stori drawer organizers. 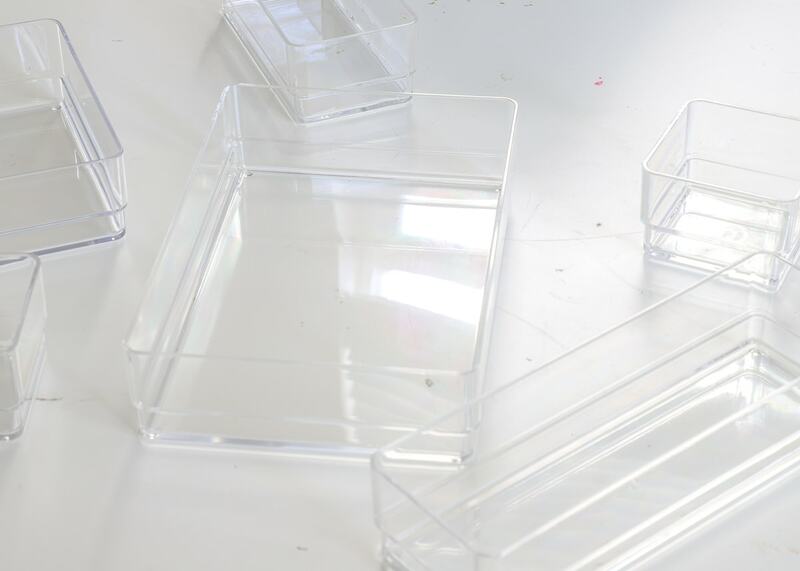 They are modular, clear acrylic, reasonably-priced and were very similar to another set I had purchased at HomeGoods years ago and successfully used in our kitchen. 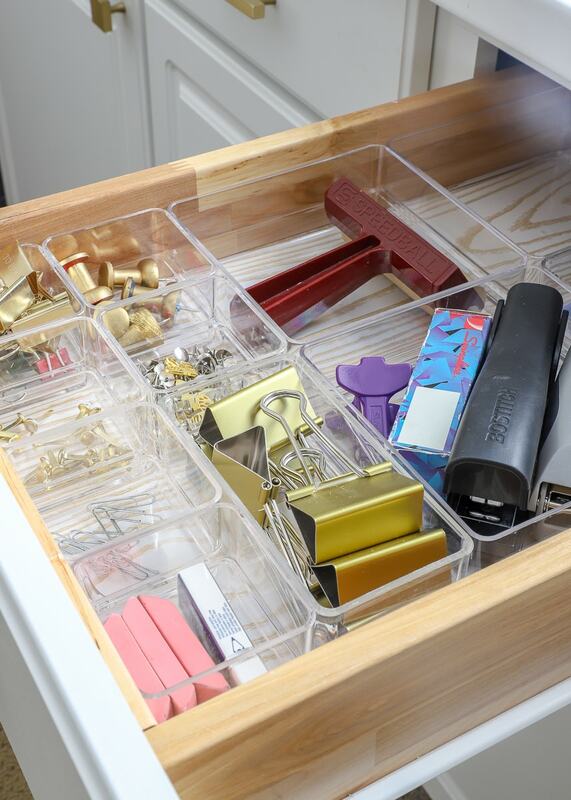 I knew they were the perfect way to outfit my office drawers for good…but first, I had to figure out what I needed and how many of each! 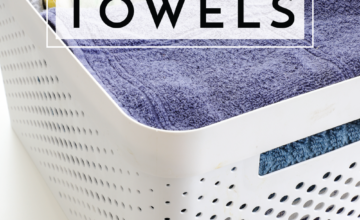 You guys know that outfitting drawers with bins, boxes, baskets, organizers, etc is my all-time favorite (and easiest!) 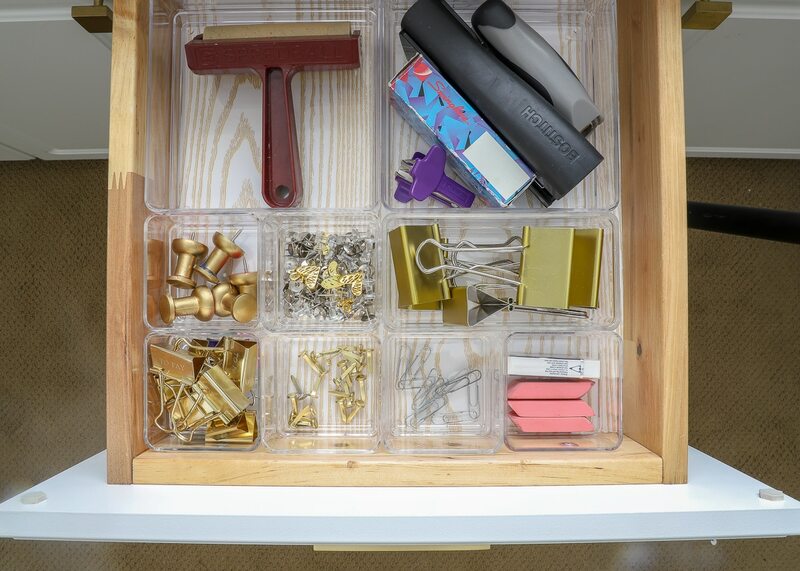 way to organize a drawer (learn more about how I do it here). But sometimes figuring out how things fit together just right can take a lot of trial-and-error. And what do you do when you have a lot of drawers to organize and/or have lots of organizer sizes at your disposal? 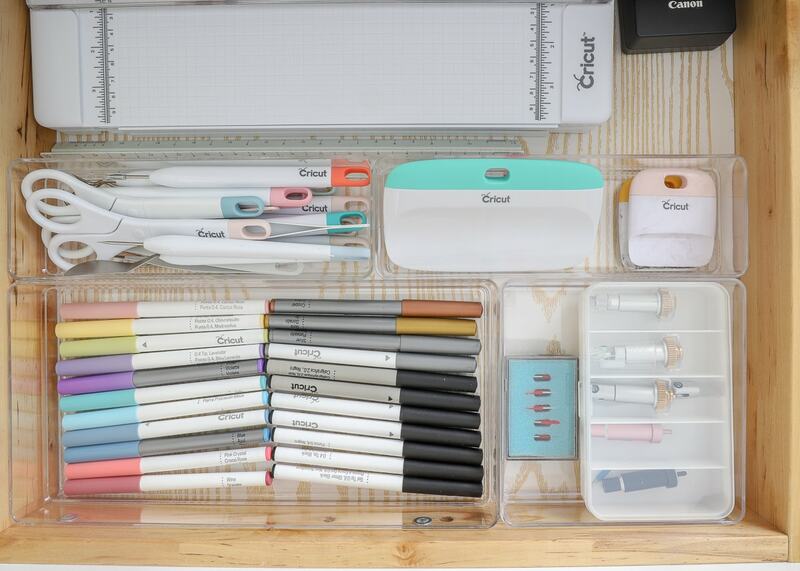 The Stori organizers come in 8 different sizes (!!!) and I didn’t just want to blindly order them in the hopes they’d work or fit together just right. So I created a mock-up of our drawers and the available organizers on my computer and set to planning! NOTE: I did the following exercise in Adobe Illustrator, but you can likely do the same thing in Canva, Photoshop, or even Microsoft PowerPoint. You could also do this on graph paper, but doing it electronically allows you to move things around much easier! 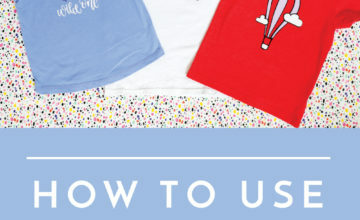 Just make sure you set your dimensions to inches/centimeters (whatever you use/prefer). I first created 5 “boards” (shown below in white) that were sized to the exact dimensions of my office drawers. 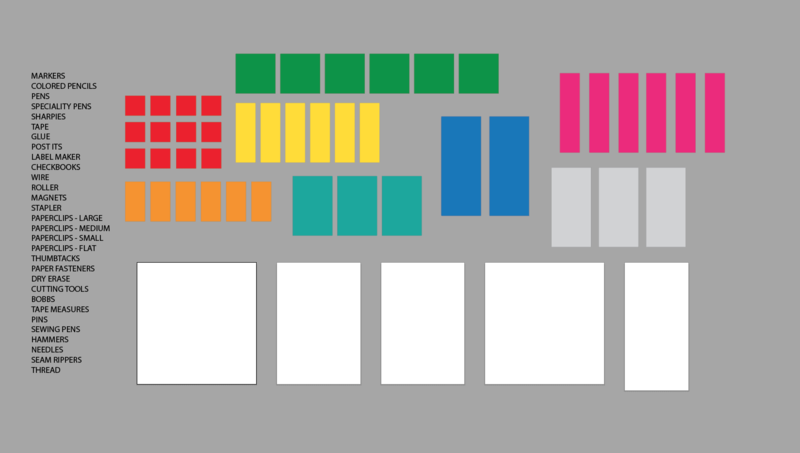 I then created boxes to represent each of the Stori drawer organizers (all the colored boxes below), including their exact sizes as well as the quantities they came in. 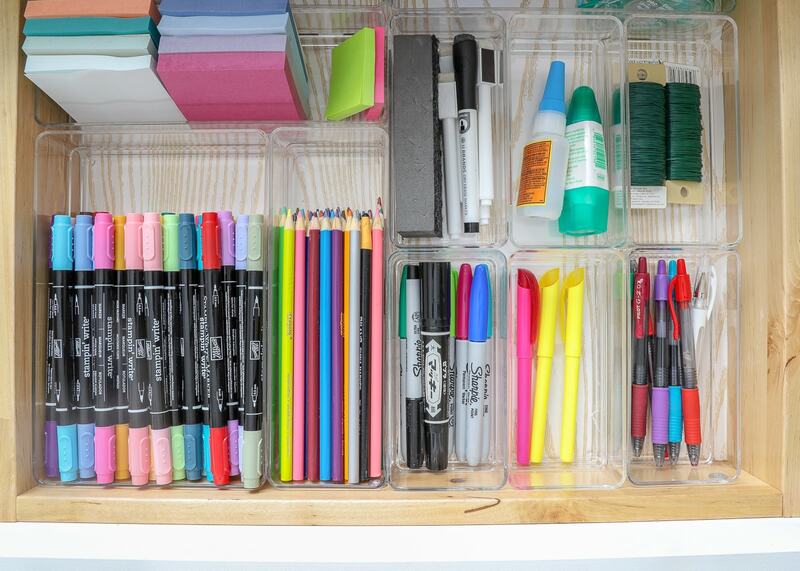 As an example, the 3×3″ organizers (shown below in red) come in sets of 12. Finally, I listed out everything that needed to be stored in these drawers. 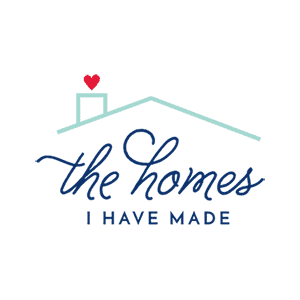 As I planned, this allowed me to ensure that each item was given a home, and that those homes were the right size for that item! 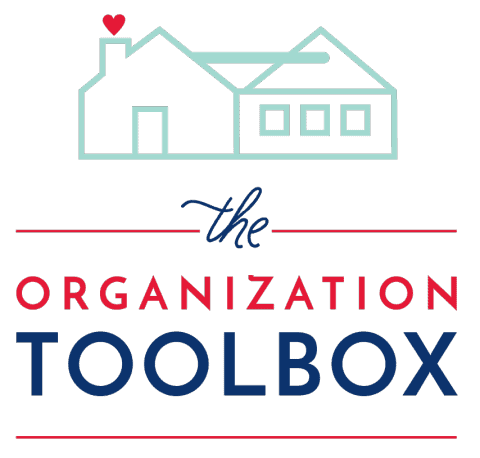 First, all the Stori organizers come in sizes divisible by 3″. 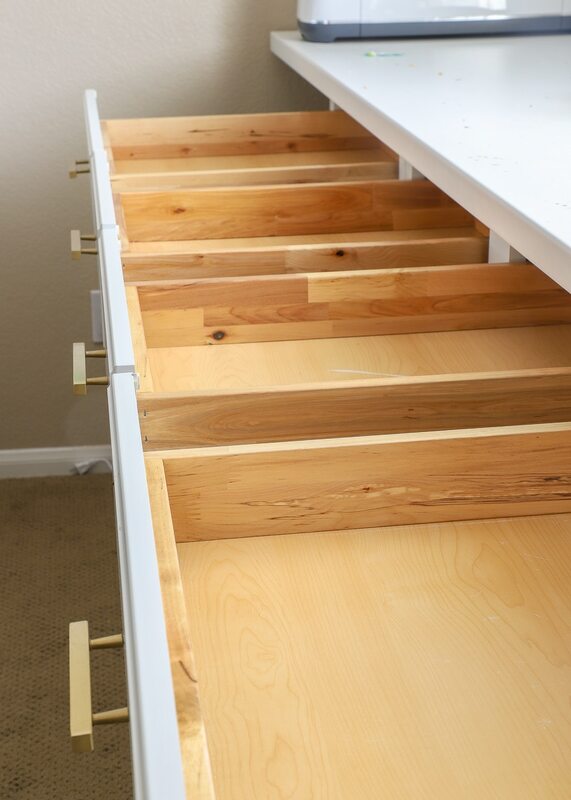 My drawers always had 0.5-.75″ left over both horizontally and vertically no matter what configuration I tried. I’ll show you how I dealt with that leftover space below. 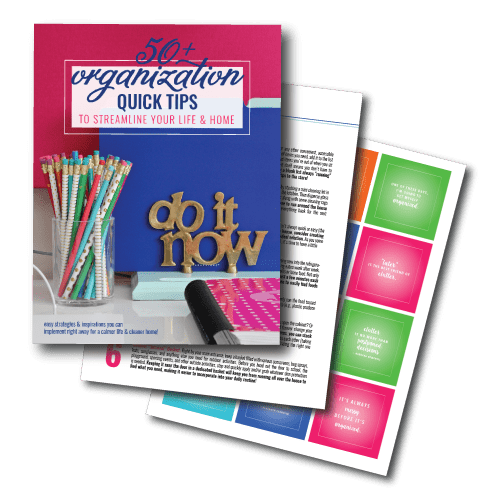 I was prepared to buy all the different-sized organizers; but as I was playing with various layouts, I found I didn’t need the pink set (the 12×3″) or the blue set (the 15×6″). 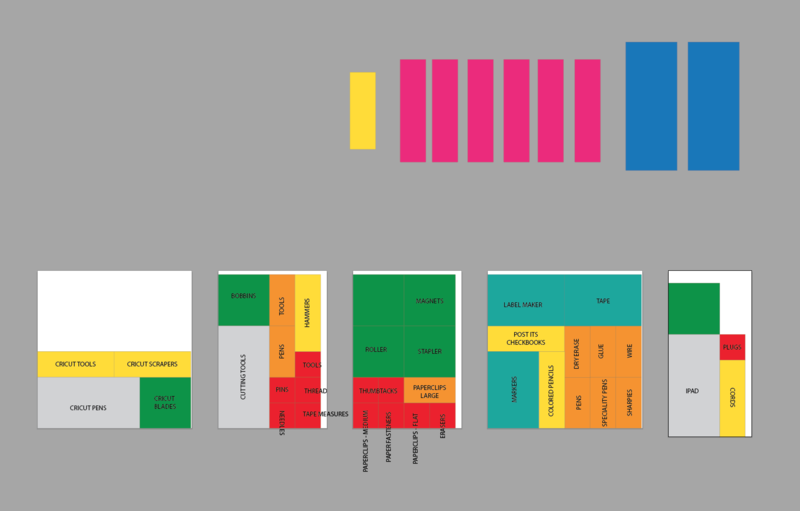 This configuration left me with 2 6×6″ units without anything to put in them. I always like to plan in space to grow, so having this extra space was A-OK with me! 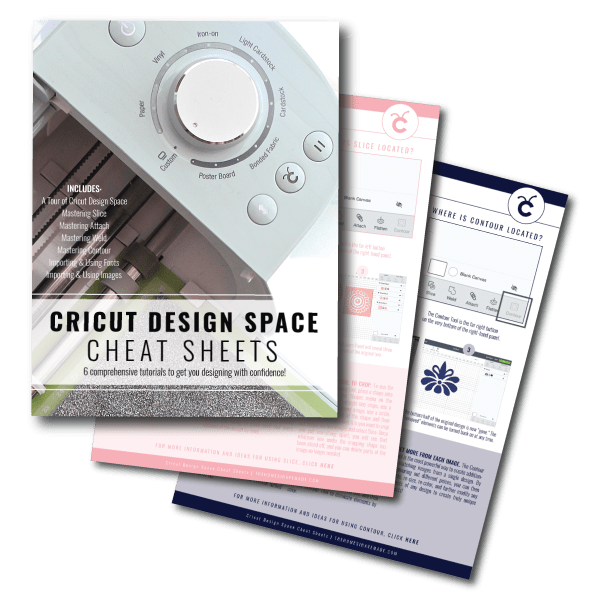 I ended up purchasing single boxes of the 3×3″, 3×6″, 3×9″, 6×6″, 6×9″ and 12×6″ organizers (see all the options here) for a total of about $100. After placing my order, I turned to getting my drawers prepped and ready! Although it took me forever to remove the old contact paper, I didn’t really hesitate to add new paper to the bottom of the drawers. Why? 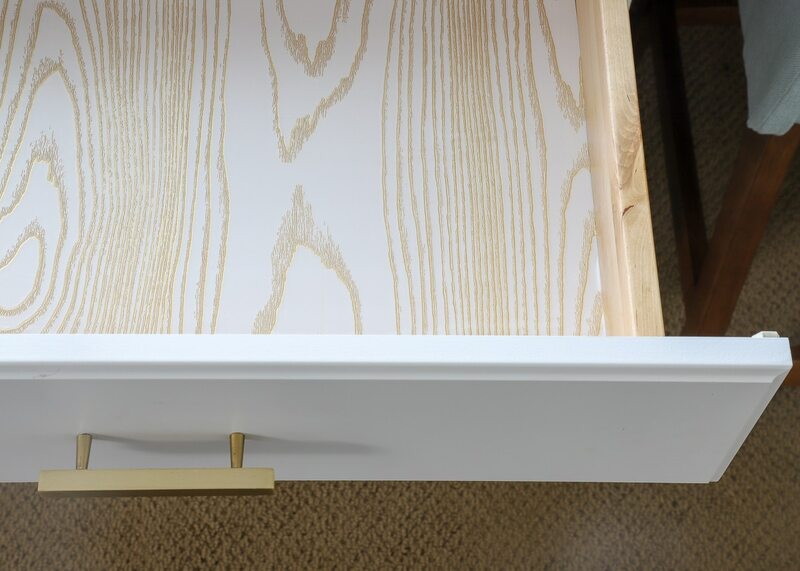 I LOOOOVE the look of a subtle pattern in the bottom of drawers and I feel like it gives everything a much more polished look. Instead of papering the sides this time, I just papered the bottoms, and I picked some gorgeous neutral paper that will hopefully stand the test of my design whims over the years to come! Tip! 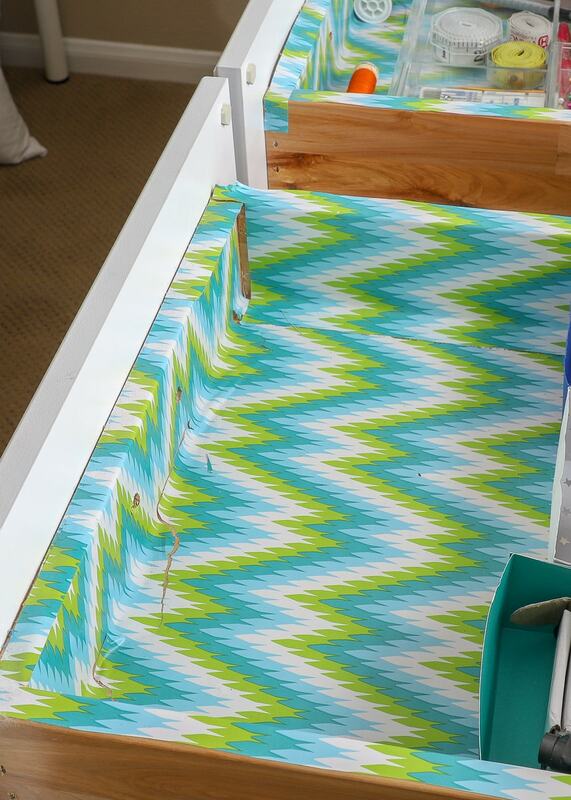 Want to see exactly how I paper drawers and cabinets? See my full tutorial here! I chose this white-and-gold woodgrain paper because it was thick, sturdy, and more neutral than what I had before. I also loved that the gold veining had a metallic sheen to it that plays off other elements in my office. I didn’t quite expect the paper to work SO well with the natural color of the drawers and the white counters/cabinetry. 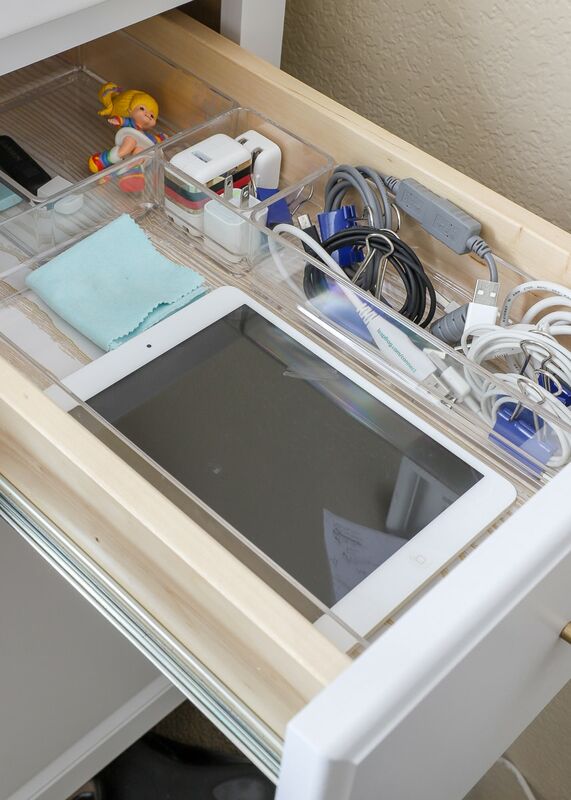 Already, the drawers were looking so much crisper and cleaner! Once the drawers were cleaned out and re-papered, it was really smooth sailing from here since I had done all the planning ahead of time! 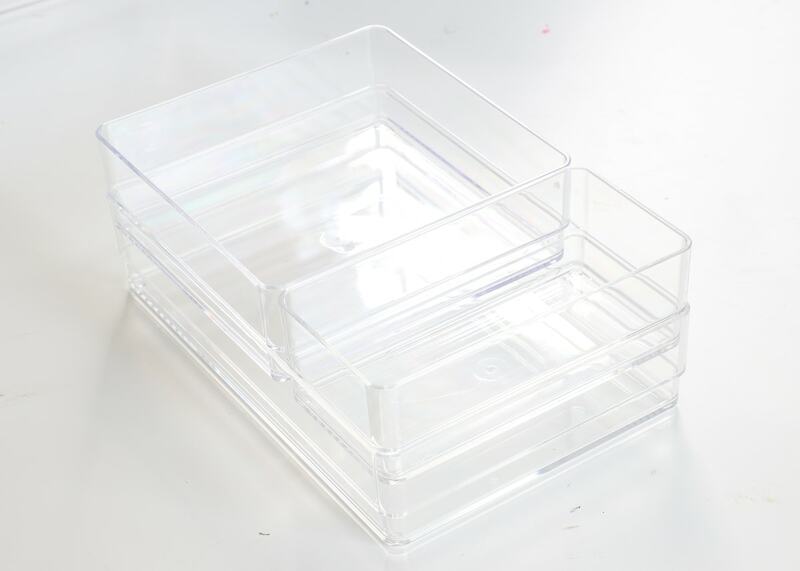 When I unboxed the acrylic organizers, I was admittedly a little giddy and super impressed. Not only do they all line up really nicely side-by-side, but they also nest perfectly. PERFECTLY! It didn’t occur to me that I could have put two layers of organizers in my drawers. I actually don’t need that much space but it’s good to know that’s always an option! Because all my planning we pre-done, I just loaded the various organizers into my drawers per the layout on my computer! 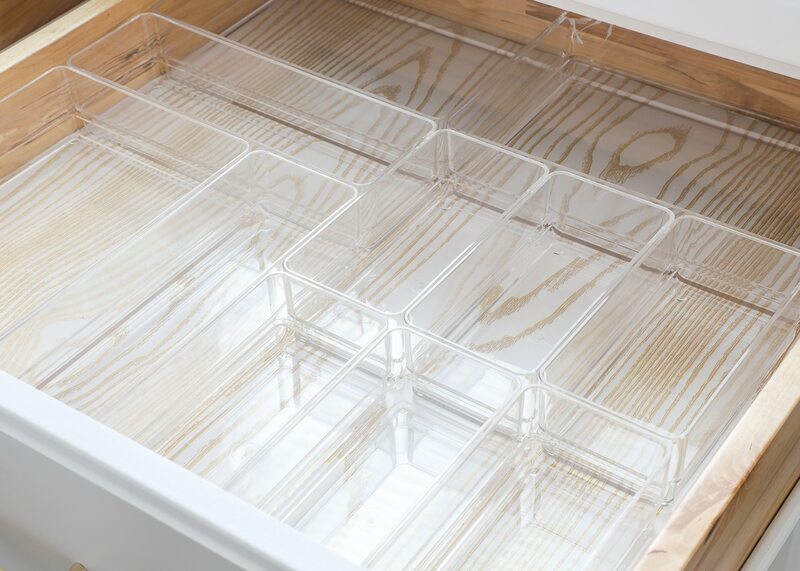 Now…I sure do wish that these drawer organizers fit my drawers EXACTLY…but that’s pretty wishful thinking with an off-the-shelf product. Since I had about 0.5-0.75″ gaps along the side and back of each drawer, I needed to keep the organizers from sliding all around. To do so, I returned to my old trick of placing thick double-stick tape (similar) on the four corners of the organizers. 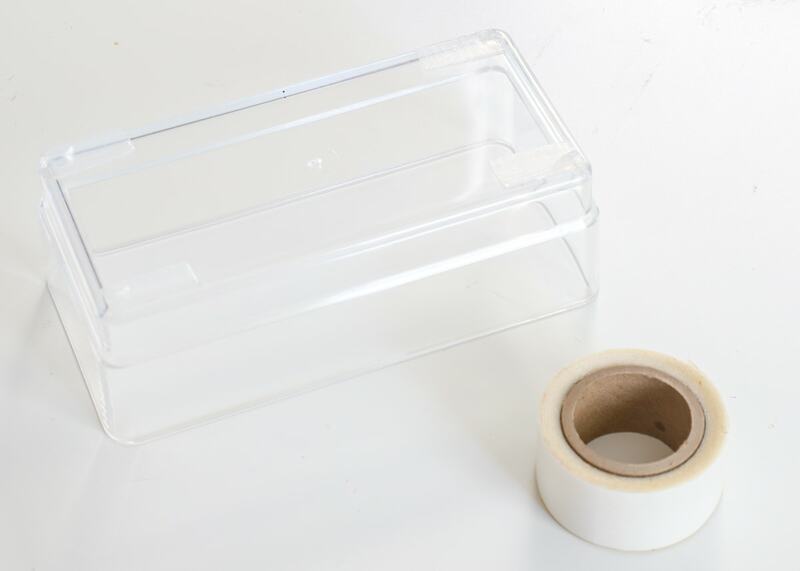 But listen…you don’t need to add tape to the undersides all the organizers (unless you want to). 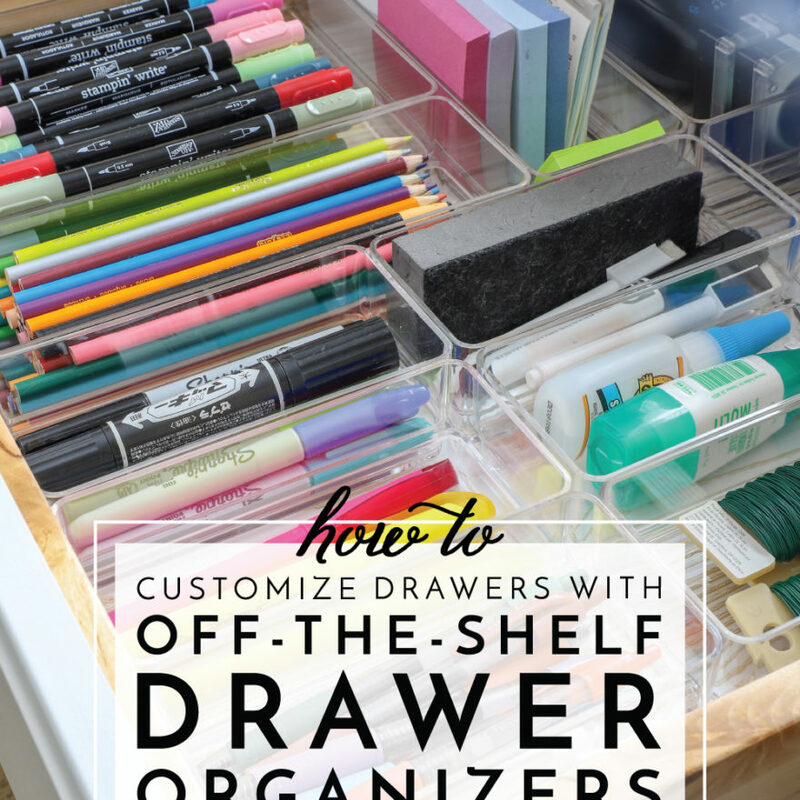 Move all the organizers tight to one side and to the front of each drawer. Then secure the far (non-buffered) side and very top undersides with tape as denoted by the black lines above. 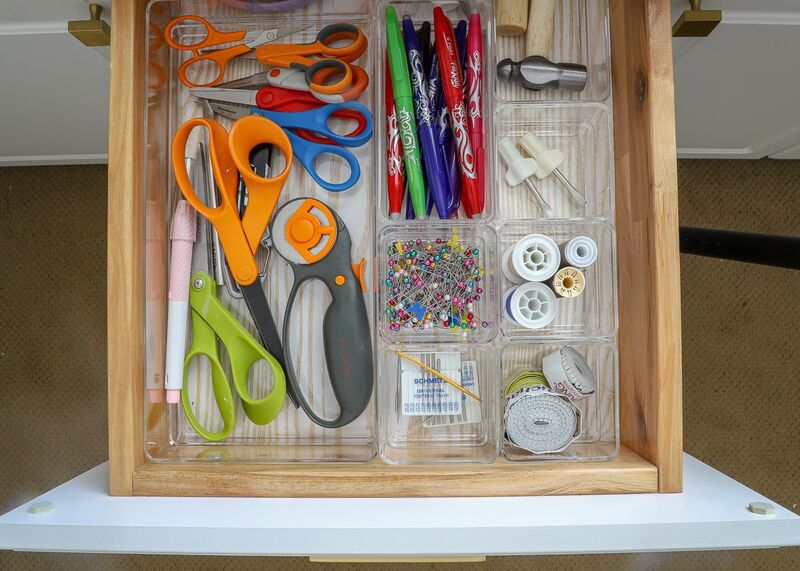 By simply securing the outermost organizers, all the rest will stay put as you open and close the drawers. 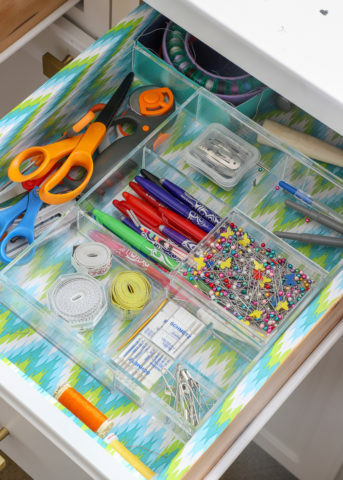 Those small gaps between the organizes and drawer side can be used for skinnier items such as rulers! And just like that (snap! 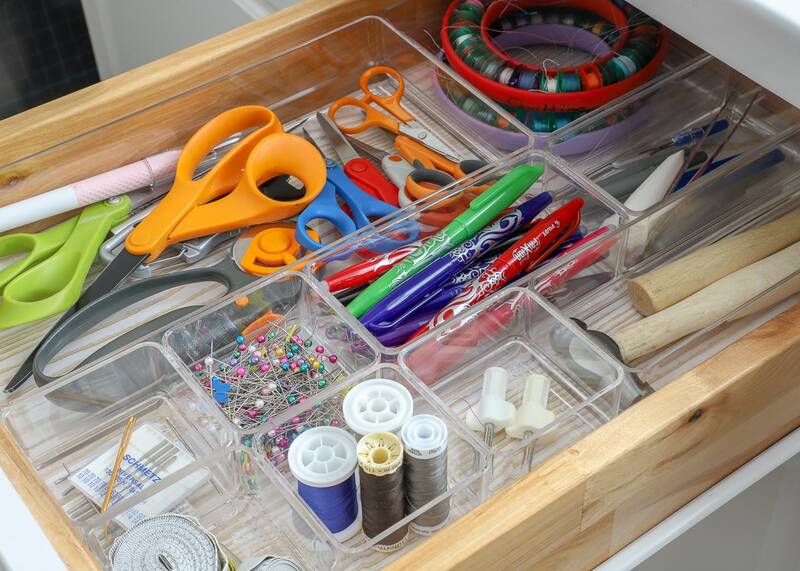 ), you have perfectly customized drawers, for your specific things, laid out exactly as you need them, all using off-the-shelf items! The final step is to fill your drawers back up, which again, should go smoothly since you already planned everything out! 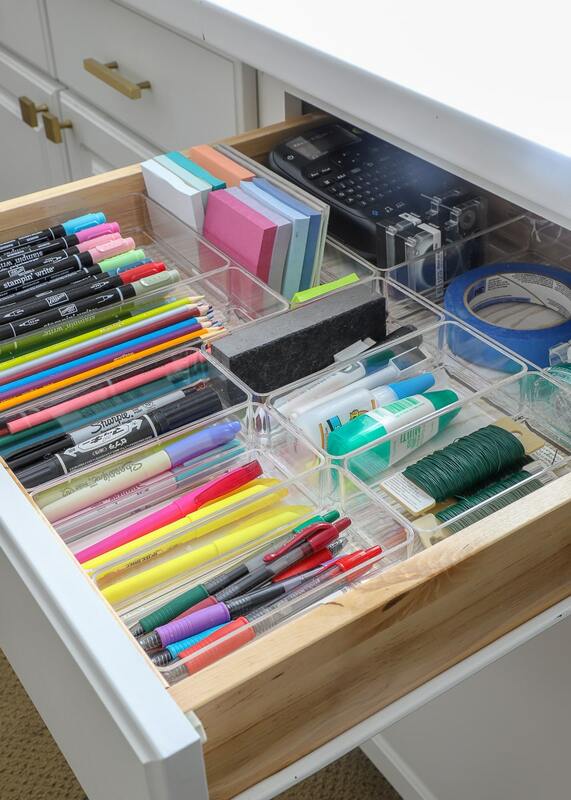 Ready for some lovely drawer eye candy?!? The far left drawer sits right below my Cricut machine. As such, it made most sense to outfit it with all my Cricut tools. The next drawer is my sewing drawer. While I have other tools and notions stored in the cabinets below, these are the tools I use most when doing simple projects. 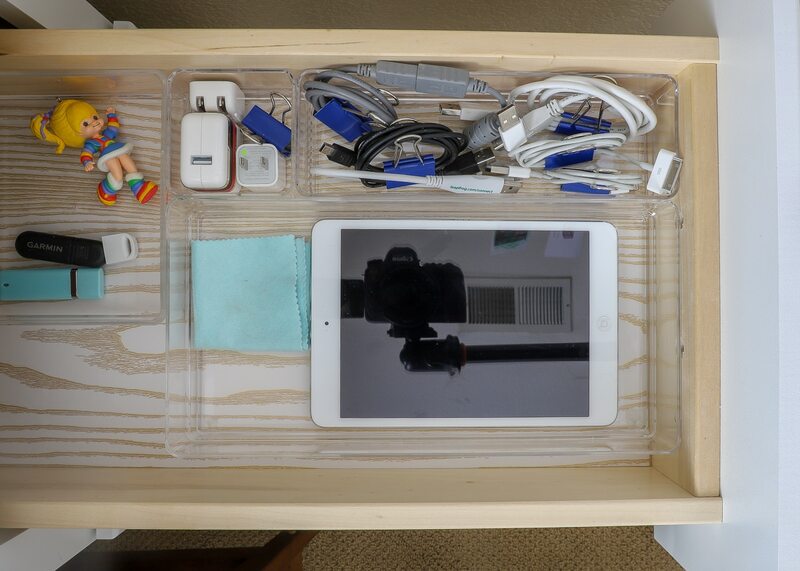 And finally, the drawer to the right of the computer holds electronic items and cords. 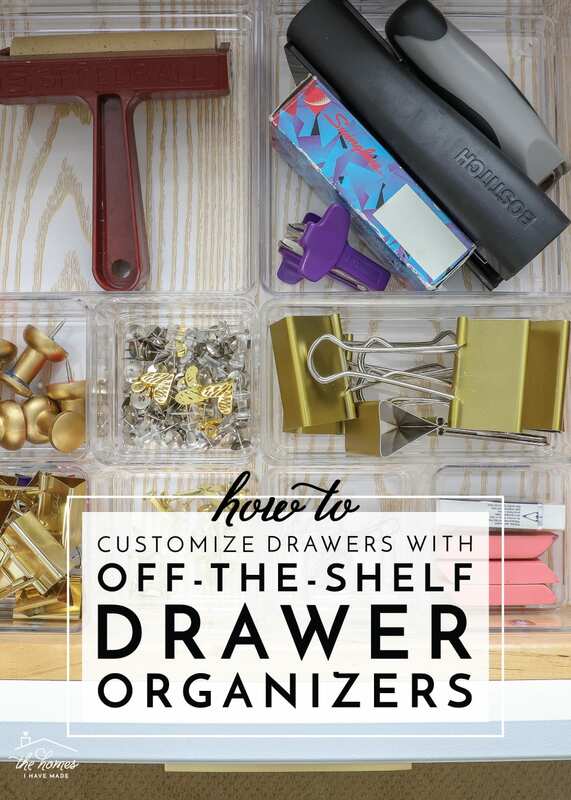 Sometimes, outfitting drawers with off-the-shelf drawer organizers that you find at HomeGoods or Target can be a bit of an exasperating experience. Either the organizer doesn’t fit, your items don’t fit, or there is so much extra room leftover that the organizer is hardly worth it! 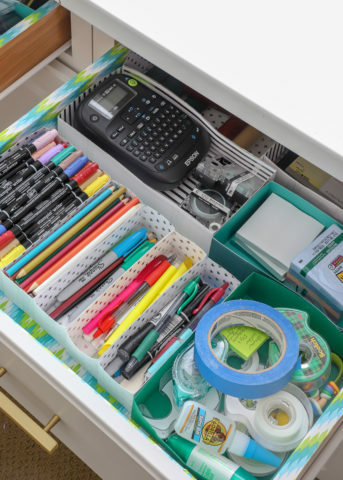 Rather than relying on all-in-one organizers, this modular system allowed me to not only fill up (almost) every inch of space in my drawers, but also select organizers that sufficiently hold what I need to store and place it exactly where I want it. 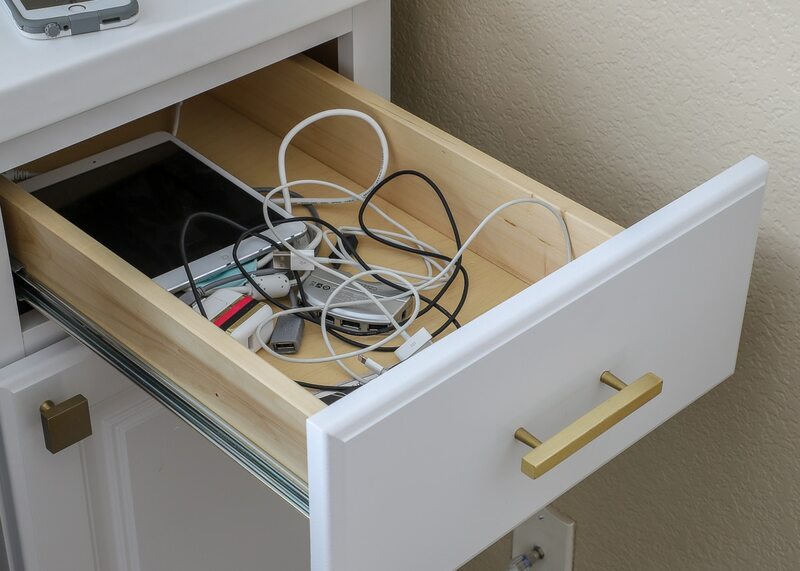 This combination provided me with perfectly customized drawers that didn’t cost a fortune nor took me ages to DIY! That’s a win, win around here these days! In my entire office, these drawers are the most prime real estate. As such, I took a lot of care to ONLY place things in these drawers that get used regularly. The whole family is going in and out of these drawers on a daily basis, and it’s so nice that we can now clearly see where everything is! 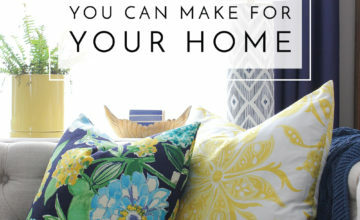 I have a hunch you may want to see some of my unique storage solutions in more detail – don’t you worry – I have a big craft organization post in the works, where I’m going to show you around my entire office/craft room, including inside those cabinets! I hope to have that all pulled together for you next month! Until then, have a wonderful weekend, friends!